As I become busier in my practice, helping people heal, I’m finding that I have less time to play in my kitchen to create new recipes. Yet, I always like to bring something new and delicious, and easy to you each month so that you will be able to increase your repertoire of recipes that will help you to use food to keep your taste buds happy and to keep your body and brain happy too! 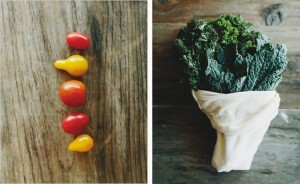 To solve the dilemma this month, I’ve borrowed a recipe from one of my favorite food blogger’s Sara Forte. I re-discovered Sara’s blog, The Sprouted Kitchen a couple weeks ago when I was doing a search for sprouted quinoa. I had met Sara, at least 5 years ago in a yoga room. 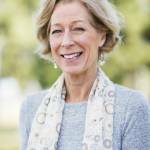 She was actually one of my students-very serious in the yoga room and very playful when writing and in the kitchen. Back then, she was already blogging and coming up with amazing recipes, but only as a hobby. What was a hobby then, has become what she does pretty much does full time and she is oh so very good at it!!! I have never been disappointed when I’ve tried Sara’s recipes and her photographs are almost as yummy as her dishes. She’s also published a beautiful cookbook where you can find her mouthwatering, body nourishing recipes and photos. 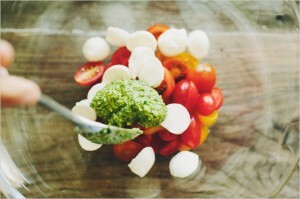 So here is Sara’s Arugula Caprese Kale Pesto Salad. Buon Appetito! hey marinate in the pesto for better flavor. Just leave the mix at room temperature for awhile so the pesto dressing will distribute easily. Add arugula just before serving.